The four blends are all inspired by hit skits like The Californians. This new collection of wines based on TV’s legendary sketch comedy show Saturday Night Live proves a Saturday night in can be just as entertaining and enjoyable as a Saturday night out. The limited edition collection from Lot18, an online retailer of high-quality, hard-to-find wines, features four blends, all inspired by skits and fan-favorite characters from the Emmy-winning sketch comedy show. That includes a 2016 Saturday Night Live California Red Blend, 2016 Stefon Beaujolais, 2016 Debbie Downer South Eastern Australia Chardonnay and 2015 The Californians Monterey County Merlot. 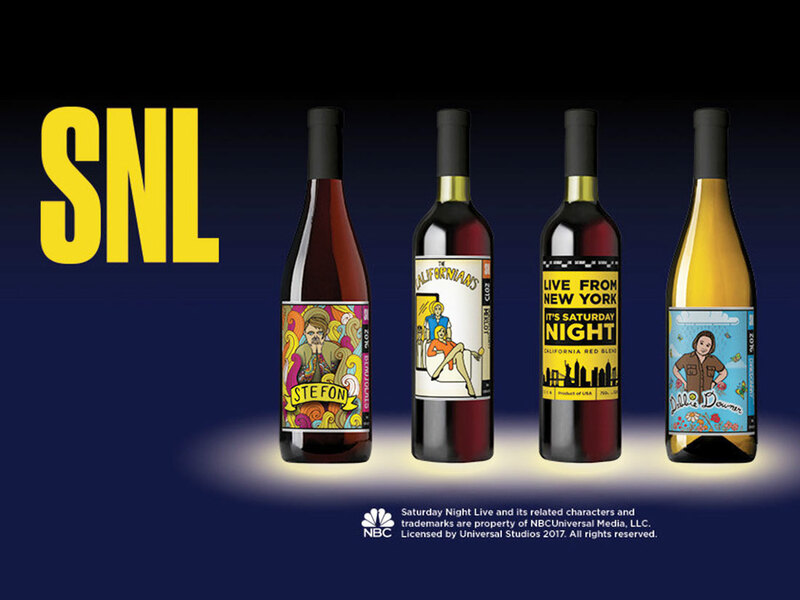 The four wines, each hand-crafted blends with uniquely designed labels, are a collaboration between the long-running Lorne Michaels-led comedic late-night staple and Universal Brand Development. According to Lot18, the California Red is both bold and dense, a combination of Merlot, Zinfandel and Petite Sirah offering firm, chewy tannins and black cherry, black plum, vanilla, dried herbs and oak flavors. It's a perfect representation of the sketch show, known for its sweet and sometimes tart, well-aged takes on everything from pop culture to politics. A different kind of Californian blend, the Californians Monterey County Merlot aims to encapsulate the exaggerated essence of this soap opera parody about a group of wealthy Southland people, through its full-flavored mix of black cherry, plum and roasted coffee bean, with grapes sourced from sustainable vineyards and grown in mineral-rich soils. You can't forget two of SNL’s most iconic characters, Stefon (played by former cast member Bill Hader) and Debbie Downer (played by former cast member Rachel Dratch), who have their own blends. Inspired by the spirited and zany gay New York City travel correspondent for Seth Meyers' Weekend Update, the Stefon Beaujolais is said to feature juicy, exuberant red fruit flavors of cherry and cranberry alongside savory notes of violet and black pepper. Meanwhile, Dratch’s iconic killjoy is represented through the collection’s South Eastern Australia Chardonnay, a balance of rich and creamy and a vein of acidity, the wine apparently sports aromas of toasted oak and nuts, and bursts of citrus and orchard fruit. Unlike the comedy show, you won’t be able to catch re-runs of these flavors. Currently available for pre-order, there are only a limited number of these specially-created wines available exclusively at Lot18.com/SaturdayNightLive.